Heat oven to 350°F (325°F for dark or nonstick pans). 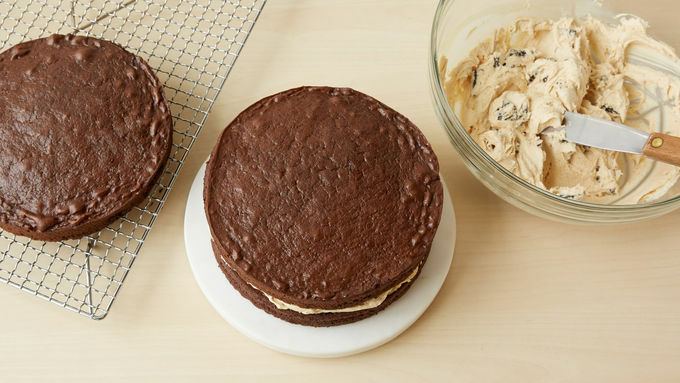 Spray bottoms and sides of three 8-inch round cake pans with cooking spray. In large bowl, beat Cake ingredients with electric mixer on medium speed 2 minutes, scraping bowl occasionally. Pour 1 2/3 cups batter in each pan. Bake 20 to 24 minutes or until toothpick inserted in center comes out clean. Cool 10 minutes; remove from pans to cooling racks. Cool completely, about 1 hour. 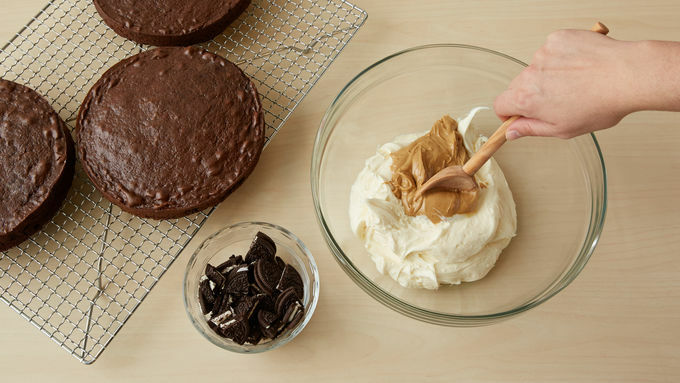 In large bowl, beat vanilla frosting and 1/2 cup peanut butter with spoon until well blended. Stir in 1 cup crushed cookies until blended. 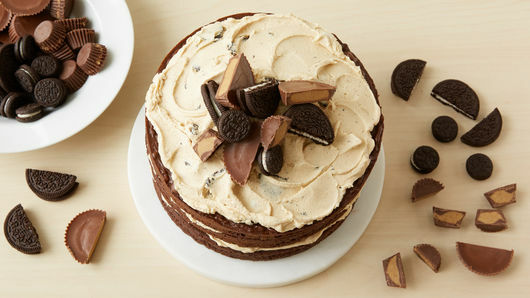 Place one cake layer on serving plate. Spread 3/4 cup frosting on top; top with second cake layer. Spread 3/4 cup frosting on top; top with third cake layer. Spread remaining frosting on top, mounding frosting in center. Refrigerate 30 minutes. In small microwavable bowl, microwave chocolate fudge sauce uncovered on High 10 to 30 seconds or until thin enough to drizzle. Drizzle warmed sauce over cake. In another small microwavable bowl, microwave 2 tablespoons peanut butter uncovered on High in 10-second intervals until thin enough to drizzle. 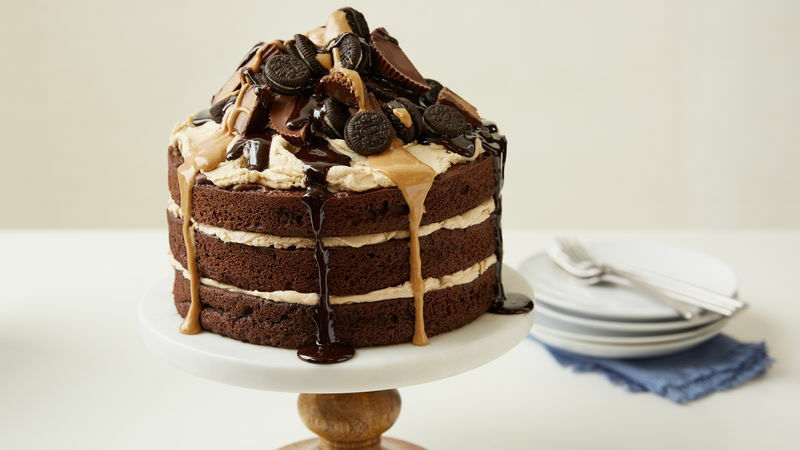 Drizzle warm peanut butter over cake. Store any remaining cake loosely covered in refrigerator. There is no one way to decorate this cake. 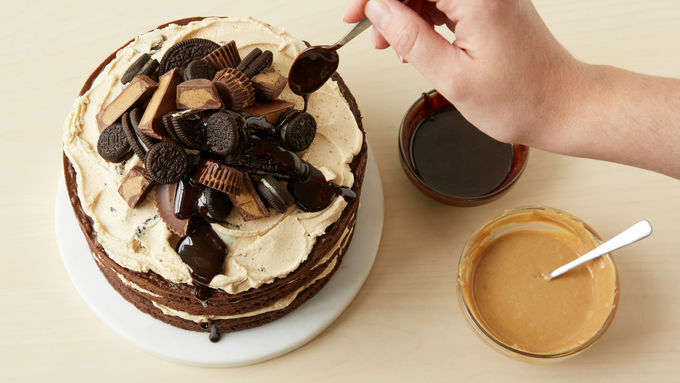 Half the fun is using whatever combination of Decorations that will satisfy your peanut butter and chocolate lovers! If baking three layers but not all three fit in the oven, refrigerate one pan of batter until others are baked, and then bake remaining layer separately, adding a little bake time if necessary for refrigerated batter. For even more peanut butter flavor, try using Peanut Butter Oreo™ cookies instead of regular ones.